The negative effect of various environmental stresses is partially due to the generation of reactive oxygen species (ROS). ROS were originally considered to be detrimental to cells. However, it is now recognized that hydrogen peroxide functions as a trigger for induction of many genes encoding enzymes involved in cellular protection under stress. In a number of abiotic responses, NO generation occurs in parallel with H2O2, and both molecules can act synergistically and/or independently. Studies have shown that NO and H2O2 function as stress signals in plants, mediating a range of resistance mechanisms. The main place of the signal perception of worsening environmental conditions is the plasma membrane. On the other hand, one of the major proteins of the plant cell membrane is the plasma membrane H+-ATPase (PM H+-ATPase), a key enzyme in adaptation of plants to abiotic stresses. In plants exposed to different abiotic stresses, e.g., salinity, heavy metals, and low or high temperature, an increase in permeability related to membrane damage is observed. Maintaining ionic balance and replenishing the loss of essential substances are important issues. Support of active transport of ions through the plasma membrane requires increased generation of an electrochemical proton gradient by PM H+-ATPase, which results in a proton-motive force used by active transporters for assimilation of various nutrients, as well as for releasing toxic ions from cells. NO and H2O2 are important elements for understanding the mechanisms of PM H+-ATPase modification at both genetic and posttranslational level. 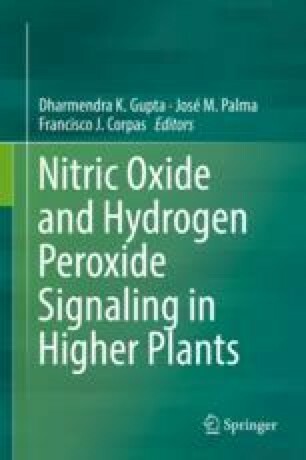 Nowadays the role of NO and H2O2 as well as the signal cascades by which signaling molecules participate in plant responses to changing environmental conditions is under intensive study.